PRIVATE SALE OF IMMACULATE SONY BRAVIA TELEVISION KDL 26U2000. DARK SILVER. USED VERY OCCASIONALLY. NO SCRATCHES OR MARKS. WITH REMOTE AND OPERATING INSTRUCTIONS. COLLECTION ONLY FROM WALMLEY SUTTON COLDFIELD NORTH OF BIRMINGHAM. ORIGINAL COST £400. Excellent condition Sony Bravia KDL-26S2030 Freeview TV, Remote and Instructions, one owner, perfect size for a bedroom or kitchen. Local pick up only from near Guildford. I will only accept cash on collection or payment by Paypal. Condition is Used. Collection only. Amazing sound quality. they will be reported. Toshiba 26DV665DB 26” LCD TV/DVD. Excellent picture quality. Comes as in the photos with some age related marks and scratches. Works great. Remote control included NB: ideal for wall mount as it doesn’t come with the stand bracket. Due to the size and weight of the item it is sold for collection in person only. Best suited for wall mounting as there is no stand and the power cable has been shortened (to approx 58 cm) to be wired directly into a wall plate fitting (see photo) - can be sold with a plug fitting if desired. Good Condition 26 inch Panasonic TV, Freeview, Any questions please ask. Pick up only. We build all the features you want direct into the TV! This HD LED TV has a built-in DVD player, PVR allowing you to pause, rewind and record live TV, and USB Input to play movies, music and photos from a flash disk or hard drive. Samsung LW-26A33WX 26" 7 HD LCD TV. Remote. Stand.Instructions. PA35 Collect. Samsung LCD TV. Owned from new. Original Remote, Desktop TV Stand and Owner's Instructions (English) - 64 pages. 5 out of 5 stars - Samsung LW-26A33WX 26" 7 HD LCD TV. Remote. Stand.Instructions. PA35 Collect. 1 product rating1 product ratings - Samsung LW-26A33WX 26" 7 HD LCD TV. Remote. Stand.Instructions. PA35 Collect. Be hooked on shocking plot twists and adrenalin fuelled block busters. Get all the TV, whenever you want it with Freeview Play, which lets you catch up on live and on-demand TV from your favourite channels. Sony 26” Trinitron Colour CRT TV in good used condition complete with remote control and TV stand. Model no. KV-28LS36U 220-240v 50Hz Serial no. 6072189 Please note a digital box will be required to watch tv on this set. TV has 2 scart sockets. TV works great - we've been using it up til now. Ideal size with a quality picture for retro gaming. Collection only, please let me know if you need any more information. Is in good working condition. BeoCenter 6-26. BeoCenter 6-26 26" 720p HD LCD TV. Bang & Olufsen B&O BeoLink IR eye. 19th Century Wooden Box & Apothecary Bottles x 24. - Our promise. - Item significantly not as described. Pet Supplies. Bang & Olufsen BeoLab 9 Speakers Pair of amazing speakers These are in perfect condition No cables included Free shipping to UK mainland. Small Toshiba TV for spares & repairs, Freeview and built in DVD player. No power to tv. 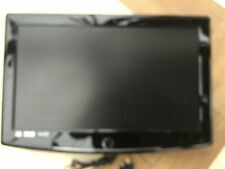 Panasonic Viera HD TV in good working condition. Picture-in-picture and Cinema progressive mode options are also incorporated into the 26LX2R. The 26LX2R also racks up points with its connections, including two HD video-capable digital inputs, one HDMI and one DVI. Alba 26" Inch HD Ready Digital Freeivew LCD TV "DVD BROKEN" "few scratches"
Freeview digital tuner. 26in (66cm) widescreen TV with 66cm visible screen size. This particular unit has got scratches on the casing only. However, the screen itself is in mint condition. Dvd player not working. Enjoy the exceptional picture quality of High Definition pictures and be fully prepared for HD sources like HDTV set-top boxes and Blu-ray discs. It has a universal connection for both analogue YPbPr and uncompressed Digital connection of DVI or HDMI, supporting HDCP. Hi and welcome to our listing for a Panasonic Viera LCD 720p HD Television TX-26LXD80 with Remote and Manual. This item is used and shows some signs of use however this works well. This includes a remote and manual. THIS ITEM IS FOR COLLECTION ONLY!!!!!! Please note non payers will be reported to ebay irrespective of reason why. We know 99% of ebay shoppers are great but some do mess us around so we have to mention this. Please bid with confidence and GOOD LUCK!!! Two year old Hitachi 26 inch television. My daughter has moved to university. Not sure what the resolution is. Has working remote control but the plastic battery cover missing. Must be collected. TESTED with Seller Guarantee -Ideal to hang onto Wall. Used Samsung 32” lcd tv good condition full working order, welcome to see working, collection only. Panasonic BT-LH2600WE. 26” plasma monitor with SDI inputs. Great monitor used as part of my edit setup but I have downsized and no longer have space for full suite. Any questions please feel free to ask. Panasonic Viera TX-L26X10B 26" HD LCD Television.FREEVIEW.HDMI.ORIG REMOTE. ORIG REMOTE. SUPERB PICTURE AND SOUND QUALITY. 4 out of 5 stars - Panasonic Viera TX-L26X10B 26" HD LCD Television.FREEVIEW.HDMI.ORIG REMOTE. 3 product ratings3 product ratings - Panasonic Viera TX-L26X10B 26" HD LCD Television.FREEVIEW.HDMI.ORIG REMOTE. ORIG REMOTE. SWIVEL STAND. FULL WORKING ORDER. Samsung 26” LCD HDTV 1080p LE26R73BD. Freeview. Condition is used. Needs new power cable (£5 approx)otherwise in perfect working condition. Collection only. VeltechTV 26 inch 1080 resolution. Condition is New, never been used still in the original packaging just been taken out to take the photos. This item is complete. Ready to plug in and watch. Product Details of DMTech DML4126WD. Nicam Digital Stereo Sound. MultiRegion Allows Worldwide DVD Discs Playback. VGA Compatible (PC In). Item sold as seen. 170 Degrees Horizontal & Vertical Viewing Angles. OTT –One Touch Tune facility USB Record & pause live TV. 21.5” HD 16.9 Widescreen. Built-in MHEG-5, HD DVBT MPEG-4 – EPG Automatic Search. Personal Video Record Terrestrial TV. Resolution – 1920 x 1080P Full HD. BeoVision 6 - 26 represents the complete application of VisionClear. The anti-reflection coating on the contrast screen reduces significantly the effect of incoming light on the screen. The dark-tinted contrast screen in front of the LCD monitor makes the screen darker when not showing an image.